Mozilla today debuted a free file-sharing service that works with - but doesn't require - Firefox and touted the service's security and privacy traits. "Send uses end-to-end encryption to keep your data secure from the moment you share to the moment your file is opened," wrote Nick Nguyen, Mozilla's vice president of product strategy. "You can [also] choose when your file link expires, the number of downloads, and whether to add an optional password for an extra layer of security." 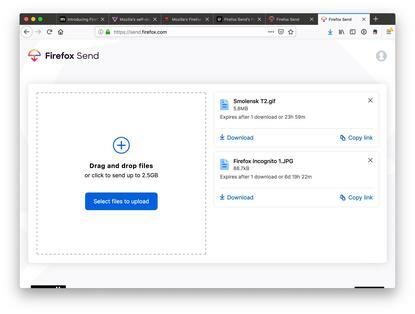 Firefox Send, formerly one of the experiments run under Mozilla's now-defunct Test Pilot program, is not an app but a website that anyone can use free of charge. Firefox Account holders - accounts are used to synchronize saved bookmarks and passwords to browsers on multiple devices - are given an edge in that they can upload files as large as 2.5GB to the service. Non-account holders are limited to 1GB uploads. Users set each file's download limit - from 1 to 100 downloads - and the download link's expiration, which can range from five minutes to seven days. After uploading the file, the user is given a link to share with others; said link can be shared via email, text or collaboration app. Upon expiration, the link won't operate; instead, the recipient's browser displays "This link has expired." For its part, Mozilla explained how it handles files uploaded to Send in this privacy document. "By default, files are stored for a maximum of either 24 hours or 7 days," the notice read. "If you choose a download cap, the file can be deleted from our server sooner." Unlike storage, sharing and syncing services such as Box, Dropbox or OneDrive, Firefox Send doesn't integrate with the device's operating system. It doesn't even integrate with Firefox; users must create a bookmark to send.firefox.com to avoid manually entering the address in a browser.